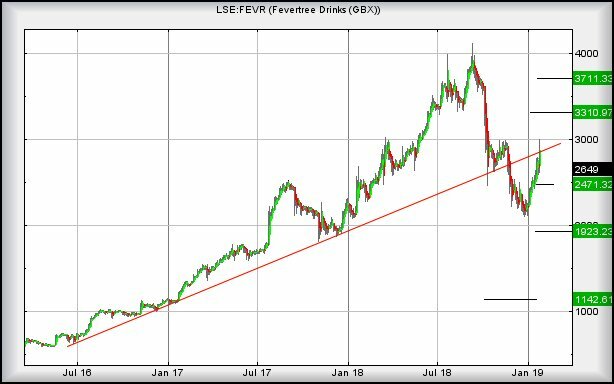 Fevertree Drinks #Brent #DAX This lots share price is all over the place. When we last reviewed it back at the end of November (link here) we’d an expectation the price intended a drop. The price managed confuse the issue, confirming the criteria for a drop, then triggering the criteria for a rise – which it met. However… we still suspect it intends reversal. As the chart shows, the share price briefly regained the big picture uptrend for the best part of a day, then was trashed the next day. The situation now is slightly uncomfortable as weakness below 2590 expects a visit to 2471p. At this point, there’s a fairly major problem thanks to CLOSURE below 2471 indicating the potential of future travel down to 1923p. Visually, there’s a major issue at the 1923p level. The price will achieve a lower low, having broken the long term uptrend. Worse, it will find itself solidly in a region where “bottom” calculates at 1142p eventually. On the subject of visual cues, it’s pretty obvious a glass ceiling exists at the 3000p level. If the current drunken stagger through share price positions intends redeem itself, there’s a pretty solid promise the share need only better 3004p to enter a cycle to an initial 3310p. Secondary, if bettered, computes at a longer term 3711. At such a level, we will need revisit the numbers. Alas, for now, we must regard it as heading to 2471 and hopefully bouncing again, next time properly and capable of closing a session above RED on the chart.